The Grand Chancellor and Minister of Foreign Affairs is the head of the executive branch. He is responsible for the foreign policy and the diplomatic missions of the Order. He is also the Minister of the Interior, in charge of the relations with the 47 National Associations of the Order in the world. Under the authority of the Grand Master and the terms of the Constitution and Code, he is responsible for the representation of the Order to third parties, the carrying out of policy and the internal administration of the Order, as well as the coordination of the activities of the Government of the Order. Albrecht von Boeselager was born on October 4, 1949 in Kreuzberg/Ahr near Bonn; he is married, and has 5 children. He was educated in Bonn at the Jesuit college Aloisiuskolleg and graduated in Law in 1974 after studies in Bonn, Geneva and Freiburg. From 1968 to 1970 he served in the military force as reserve lieutenant. From 1976 to 1990 he worked as a professional lawyer. He was admitted to the Sovereign Order of Malta in 1976, and in 1985 became a Knight in Obedience. From 1982 to 2014 he has been the Chancellor of the German Association of the Order and a member of the Executive Committee of the German Association’s Ambulance Corps (Malteser Hilfsdienst – MHD). 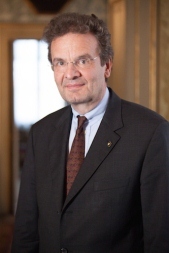 Elected member of the Sovereign Council of the Order of Malta as Grand Hospitaller in 1989, re-elected in 1994, in 1999 in 2004 and in 2009. Member of the Pontificium Consilium Cor Unum from 1994 to 2005 and member of the Papal Council of the Pastoral for Health-Care Operators since 1990. He was elected Gran Chancellor by the Chapter General which took place on 30-31 May 2014.